Color chart containing material swatches for all of our PerfecPress HTV colors. From Thomasina Jacobs of Columbus, Ohio on 4/15/2019 . From Anonymous of Buford, Georgia on 3/7/2019 . 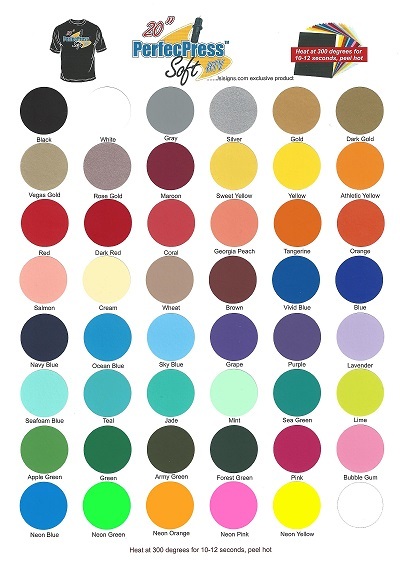 Having this color chart has made selecting vinyl colors so helpful!! From E&#39;s qualiTee designs of ATLANTA, Georgia on 2/18/2019 . These color charts have been a life saver. My customers tell me they appreciate being able to see the actual colors of vinyl they can choose from and it makes it easier for me to make sure I am giving them the color that they asked for instead of guessing because most people only know the primary colors so when you say GOLD i can show them the gold colors they can choose from and they always respond..."I didn't know there were so many Golds to choice from...thank you for showing me the different colors before we had the shirts made." I wish ya'll had the METALLIC color charts. Best product and best price!! From Anonymous of MONROE, Georgia on 1/1/2019 . From Melissa Peck of Coos Bay, Oregon on 11/26/2018 . I love the power of the JSI color chart. When i am trying to offer design options it looks great for customer review and is handy to have when I am getting ready to order.